This trip had three shopping surprises. First, I scanned my CVS card at the coupon printing machine, and I was happy to see $5 in Extra Care Bucks print out! It was my CVS Beauty Club reward - I had purchased $50 in beauty items since the last reward. In my case, probably since the beginning of the year. Free money, woohoo! I was psyched about this week's CVS deals, because this week there was a great deal on milk: Buy 1 gallon for $3.69 (my local price; yours may differ), receive $1 Extra Care Buck. That means a gallon of milk is $2.69, which undercuts ALDI's low price by 30 cents. And who doesn't like a great deal on milk? But when I got there to get the milk, I saw the second surprise - the dairy case was completely empty. I asked a cashier, and she told me that there was a problem with the thermometer in the cooler, and that they couldn't sell milk until it was fixed. Oh, well. Maybe it will be fixed later in the week. 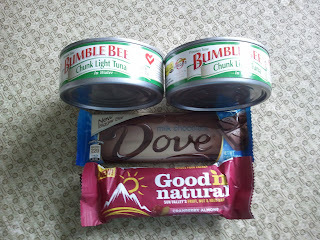 I picked up a few other deals, including the Good 'N Natural bar that was free with coupon. But after I got home, the bill seemed high, so I checked the receipt. Third surprise: although I had handed the coupon to the cashier, the cashier must have forgotten to ring it up. Ack! I will have to stop by today to see if I can get that fixed.